Swimline 9187 Jammin Cross Pool Volleyball for above ground pools includes break-away mounting brackets that easily attach to top rail. 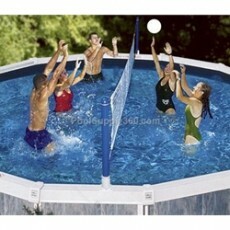 Posts and anchors are heavy blown molded plastic and net will fit pools up to 30 feet across. Includes "real feel" volleyball.